Success! Chenda from Cambodia raised $300 to get healthy. Chenda's treatment was fully funded on January 18, 2013. Two months ago, Chenda toddled towards a pot of rice and grabbed at it, splashing boiling water on his hand. The resulting injury led to a hypertrophic scar with severe contractures, completely crippling Chenda’s left hand. Without treatment, Chenda will never have proper use of his hand. Luckily, with burn contracture release, skin grafting, and physiotherapy, there’s a good chance Chenda will enjoy normal use of his hand. Chenda’s parents are farmers, and Chenda is their only child. They say he is a “very calm baby who doesn’t get into any trouble.” Let’s help them get him fixed up! 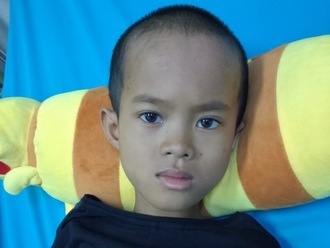 Chenda's case was submitted by at Children's Surgical Centre in Cambodia. Chenda's profile was published to start raising funds. Chenda's treatment was fully funded. Awaiting Chenda's treatment update from Children's Surgical Centre.